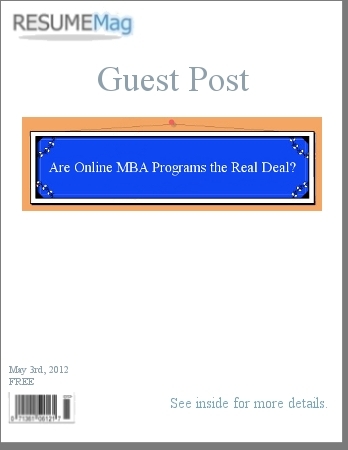 Are Online MBA Programs the Real Deal? When you’re enrolled in online MBA classes, you can pace yourself. Put dinner in the oven, park the kids in front of their homework, and sit down to your computer. Gas prices don’t bother you; you’re not going anywhere. But is the degree you earn this way legitimate; is it worth as much as a degree you would earn on a university campus? Experts say yes, and increasingly so, though online degrees given by traditional brick and mortar schools may be better for your resume over degrees given by for-profit online schools. Overall, PayScale says, people with online MBAs earn as much as people with traditional MBAs, and there may even be some advantages to the online process above and beyond convenience. While there is a sacrifice of face-to-face time with peers and faculty, the online MBA might be a solid career move for anyone who can’t afford the time and money involved in getting a traditional degree. One disadvantage of for-profit schools such as the University of Phoenix and Kaplan University is that they are not, USA Today says, accredited by the Association to Advance Collegiate Schools of Business (AACSB), which the academic community looks to as the benchmark for business school quality. But several traditional schools which are accredited by the AACSB have developed online programs in recent years. Online programs offered by the University of North Carolina, Pennsylvania State, and Indiana University, among others, are comparable to the programs these schools offer on campus; the admissions standards are the same, or in the case of Penn State, more rigorous for online. The programs are also generally taught by the same professors who teach on-campus courses, in the interest of maintaining consistency between graduates. And, apparently, a diploma from such a program usually won’t indicate whether it was received for online work, which does away with one potential drawback. But there are advantages to all online degrees. Online learning, which requires self-motivation, is seen by many as more rigorous than traditional learning, and it draws a type of student who is more disciplined. According to wahm.com, while the interactive classroom environment of traditional programs, where students may work together on assignments, mimics the real world, so, in our technological age, does online learning. Students interact with each other and professors by e-mail, chat, and sometimes telephone, much as a business executive might interact with clients from his office. Chris Consorte, who, according to PayScale, teaches both online and traditional MBA students, says that in his experience there’s no difference in salaries. “I find it depends on the person. A very aggressive student usually leverages his or her degree and finds a job making more and more money.” As time goes on, online MBAs will probably be seen as more and more legitimate by employers, making the convenience of pursuing one even more advantageous.